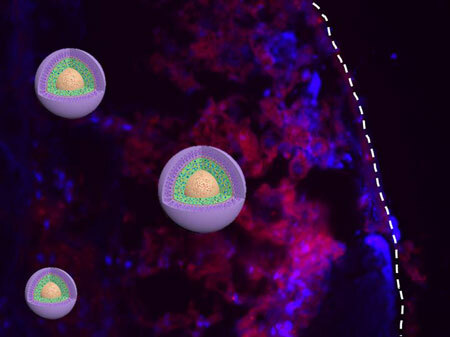 (Nanowerk News) Nanomedicines consisting of nanoparticles for targeted drug delivery to specific tissues and cells offer new solutions for cancer diagnosis and therapy. Understanding the interdependency of physiochemical properties of nanomedicines, in correlation to their biological responses and functions, is crucial for their further development of as cancer-fighters. "To develop next generation nanomedicines with superior anti-cancer attributes, we must understand the correlation between their physicochemical properties—specifically, particle size—and their interactions with biological systems," explains Jianjun Cheng, an associate professor of materials science and engineering at the University of Illinois at Urbana-Champaign. In a recent study, published in the Proceedings of the National Academy of Sciences ("Investigating the optimal size of anticancer nanomedicine"), Cheng and his collaborators systematically evaluated the size-dependent biological profiles of three monodisperse drug-silica nanoconjugates at 20, 50 and 200 nm. "There has been a major push recently in the field to miniaturize nanoparticle size using novel chemistry and engineering design," Cheng added. "While most current approved anti-cancer nanomedicines' sizes range from 100-200 nm, recent studies showed that anti-cancer nanomedicines with smaller sizes—specifically of 50 nm or smaller—exhibited enhanced performance in vivo, such as greater tissue penetration and enhanced tumor inhibition." "Over the last 2-3 decades, consensus has been reached that particle size plays a pivotal role in determining their biodistribution, tumor penetration, cellular internalization, clearance from blood plasma and tissues, as well as excretion from the body—all of which impact the overall therapeutic efficacy against cancers," stated Li Tang, first author of this PNAS article. "Our studies show clear evidence that there is an optimal particle size for anti-cancer nanomedicines, resulting in the highest tumor retention. Among the three nanoconjugates investigated, the 50 nm particle size provided the optimal combination of deep tumor tissue penetration, efficient cancer cell internalization, as well as slow tumor clearance, exhibits the highest efficacy against both primary and metastatic tumors in vivo. To further develop insight into the size dependency of nanomedicines in tumor accumulation and retention, the researchers developed a mathematical model of the spatio-temporal distribution of nanoparticles within a spherically symmetric tumor. The results are extremely important to guide the future research in designing new nanomedicines for cancer treatment, Cheng noted. In addition, a new nanomedicine developed by the Illinois researchers—with precisely engineered size at the optimal size range—effectively inhibited a human breast cancer and prevented metastasis in animals, showing promise for the treatment of a variety of cancers in humans. Tang, who obtained his PhD degree from the University of Illinois with Jianjun Cheng, is currently a CRI Irvington postdoctoral fellow at the Massachusetts Institute of Technology. Collaborators and co-corresponding authors of the paper at Illinois include Timothy Fan, associate professor, veterinary clinical medicine; Andrew Ferguson, assistant professor, materials science and engineering; and William Helferich, professor, food science and human nutrition.